The location of this picturesque hotel in the elite Boyana neighborhood is excellent as the Capital City and its sights as well as entertainment facilities, administrative, business and commercial centers are a few minutes drive from it. There are also some interesting historical, natural and cultural sights near the hotel. Only a few kilometers from the hotel are located some of the best ski runs and tourist routes in Bulgaria, in the Vitosha Mountain. 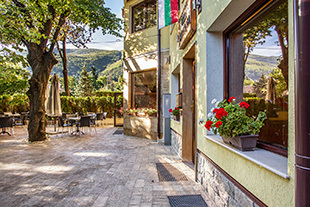 Unlike most of the three-star hotels in Sofia, the Villa Boyana Hotel is suitable not only for a family or romantic vacation, but also for business events and parties. There is a restaurant and cafe, which offer cakes, pastries, sandwiches and catering – our own production. The Finnish sauna will help you relax after the end of your working day. We offer you much more than a few days’ stay in a hotel in the Boyana neighbourhood. We offer you the oportunity to have a complete rest , successful work and unforgettable moments, shared with your loved ones.